Iomega’s StorCenter PX4-300d is the successor to the ix4-200d, both of which are specifically built for small businesses that need to store a significant amount of data. All of the models in Iomega’s PX line have similar features but differ when it comes to the number of drives and the form factor. 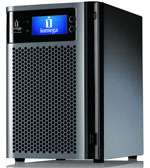 The PX4-300d and the px6-300d are desktop devices that support up to four drives and six drives respectively. The px4-300r model is a rack unit that supports up to four drives. The PX4-300d’s is very reasonably priced, which carries a street price of $699 for the diskless model and is also available in larger capacities that scale from 4 to 12 TB with a price tag ranging from $1200 to $3000. Feature-wise, the StorCenter PX4-300d has everything a business or power user could want: a media server, cloud-based remote access, integration with social media websites, support for iSCSI targets, virtual integration, and compatibility to work with Windows Active Directory. And let's not forget who's behind Iomega, the StorCenter line has plenty of EMC DNA within, enterprise knowledge that's hard for many of the other competing NAS solutions to match. The StorCenter PX4-300d is a sturdily built NAS and is reasonably quiet when operating, with a maximum noise level of 32dBA. The PX4-300d is packaged with the power brick, an Ethernet cable, and a software management-tools CD. On the front, you will find the power button at the top right and a welcomed USB 3.0 port at the bottom right. The NAS also has two USB 2.0 ports and two Ethernet ports located on the back panel, allowing it to support a wide range of devices. Setting up the StorCenter PX4-300d was very quick, easy, and will require little work by the user. It should only take several minutes to power up the NAS and have the Iomega Storage Manager locate the device on the network. During its initial set up, a wizard walks you through some common tasks, such as setting up networking and users. The StorCenter PX4-300d also creates default folders and has automated mapping, which can be easily accessible from Windows Explorer. This is a very welcomed feature since users typically have to manually create all folders and drive mappings. To test and compare the performance of the StorCenter PX4-300d, we put it head-to-head with the Synology DS411+ (2TB and 6TB models) and the Synology DS712+ (2TB and 6TB models). We measured the speed of these NAS units with IOMeter, using shares setup over iSCSI and Samba. We used four Hitachi Ultrastar A7K2000 2TB hard drives in the DS411+ and the supplied Western Digital 2TB RE4's inside the DS712+ to make sure the drives were never a limiting factor in our benchmarks. The DS712+ and the PX4-300d both have a processor speed of 1.8GHz; however, the StorCenter NAS has double the amount of RAM with 2GB of DDR3 memory. The DS411+ has a dual-core 1.67GHz processor and 1GB of DDR2 RAM. In the first test, we will look at the peak Samba and iSCSI performance using a “best case scenario” 2MB sequential file transfer with IOMeter. In all of the configuration Samba interface configuration schemes, the PX4-300d took the lead with a peak read-speed of 71MB/s (RAID10) compared the DS411’s 66MB/s. The write speed tests also showed very good performance, clocking in at 106MB/s. In the next test we looked at random 2MB/s transfers using IOMeter. In this section the StorCenter PX4-300d continued to perform well. We recorded a read speed of 48MB/s in all RAIDs and write speeds ranging from 37MB/s to 50MB/s. The DS712+ performed particularly badly in the read speed bench mark tests, performing less than half of than that of its competitors. Looking at the iSCSI results in the same 2MB random transfer tests, the tables have turned with the DS712+ leading the pack in all tests, especially in the write speed column. This time around, the DS712’s read speeds varied between 68 and 65MB/s (highest on RAID1) and blistering write speeds from 104 to 108MB/s (highest on RAID0), almost doubling its competitors. The PX4-300d fell a little behind during these benchmark tests, with a top read and write speed of 63MB/s (RAID0) and 65MB/s (RAID0) respectively. The PX4-300d dominated the iSCSI results in the read column with a peak speed of 0.86; however, the DS712+ annihilated the competition with its blistering write speeds ranging from 1.8 to 3.6MB/s, which more than triples the write speeds of the DS411+ and the PX4-300d. Iomega’s PX4-300d fills the gap in the company’s product line for an affordable NAS while providing a nice balance of storage capacity, configuration flexibility, and features for small businesses and power users. Out of the box it is simple to setup and start serving files to your work group or home office. Long term maintence is also easy through the web interface, with quick status messages without having to dig through the console. One of px4-300’s more attractive features is that it now supports SSD drives and gives users the ability to create drive pools for different volume configurations. Out of the box with four drives the PX4-300d will support RAID5 (+ hot spare), RAID10, or single JBOD. Additionally, Iomega’s newest PX model has enough enterprise-like features (e.g. Active Directory, SNMP and cloud integration) that allow it to be used in a wide range of environments. If you’re just looking at features alone, the PX4-300d ranks near the top with its ability to support almost every type of protocol and device that is available on the market. Overall we were very pleased by the good mix of performance or usability, with only some reservations about the power consumption... which could be mitigated by low-power drives. The StorCenter PX4-300d has something for everyone; it’s rich with features and has very good performance. Overall, this is a recommended network storage device.